Okay, so while the shopping nearly killed me, the eating certainly isn't!! TADA! Jealous yet? It tastes even more fantastic than it looks! (not to mention it's ridiculously simple to make) I could get used to this kind of royal, organic treatment. What's that? You want to make it too? Sure, I'll tell you how! Oil up a trusty cast iron pan, and fry up some chopped celery and onions. Once they're tender, move them into a bowl, and put a bit more oil into the bottom of the pan. 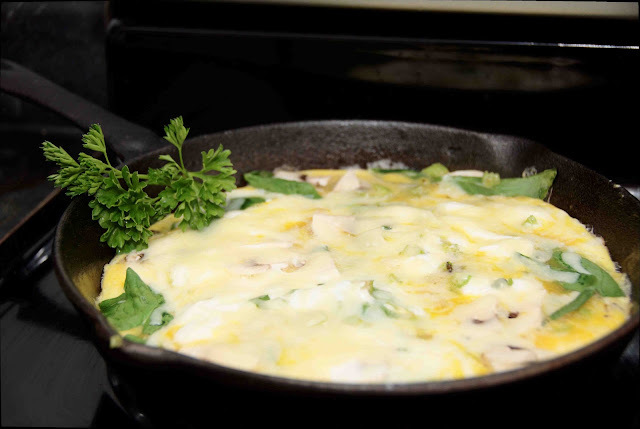 Toss in your spinach (enough to cover the bottom of the pan), scrambled eggs with seasoning and sour cream mixed in, the celery, some mushrooms, and then top it off with a bit of cheesy goodness! Good layering is key, as well as having everything pre-chopped! You can then either cover it on the stove until it's cooked and the cheese melts, or put it uncovered in the oven for a toastier result. Now, if you'll excuse me, I have an omelette to eat!